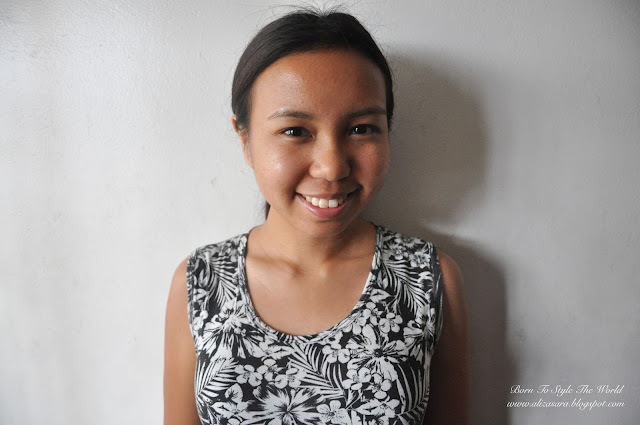 I believe that every individual deserves to feel beautiful and also in order to be beautiful, you need the best skincare for your skin. If you happen to be Asian, this would be another skincare which I would recommend suitable for the Asian skin, and the Asian weather. 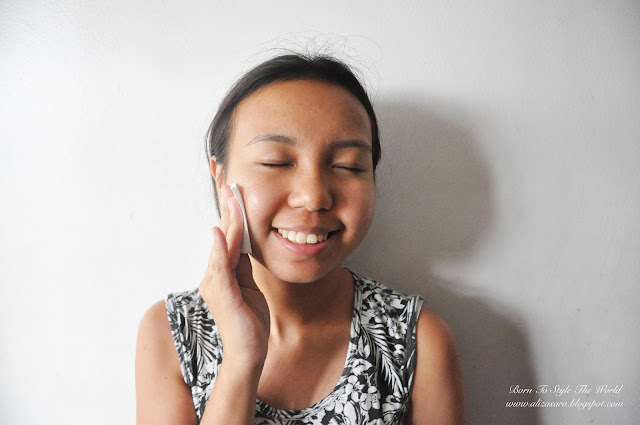 A big big thank you to NEESYA's team for giving me a chance to try the product out myself on my oily combination skin to see how well does it do wonders on my skin. 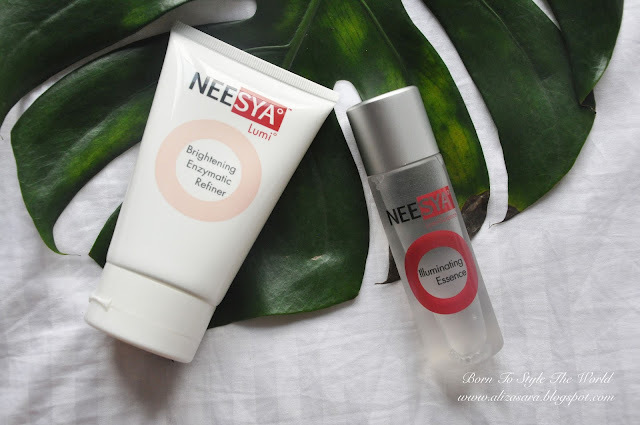 What makes NEESYA special would be that it gives users a chance to naturally illuminate skin with Neesya LumiScience ® Technology and emerge with luminous skin through Neesya’s 360 complete, customized skincare system. Its all about enriching lives with effective, scientific beauty care, made affordable to everyone. Honestly speaking, I didn’t think the package was that attractive as it looks very clinical, but along with the term ‘Never judge a book by its cover’, this definitely can be applied to Neesya cause the results are way better than which what was expected. 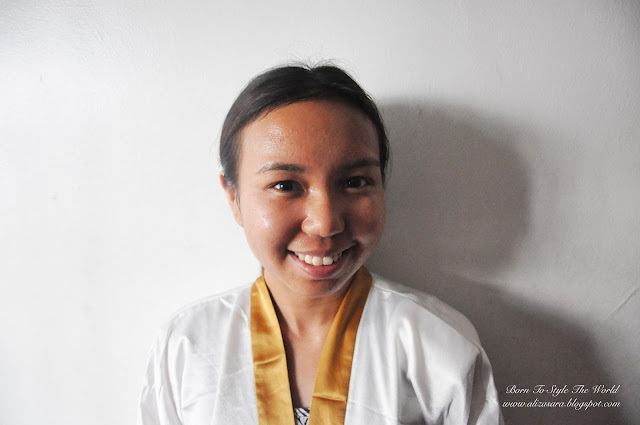 And believe me, for the past 1 month of using Neesya, it has made a huge difference to my skin. A close up shot of the Hologram sticker. There are 3 products in the Intensive Overnight Radiance Range, which i will show you how it should be applied to your face. 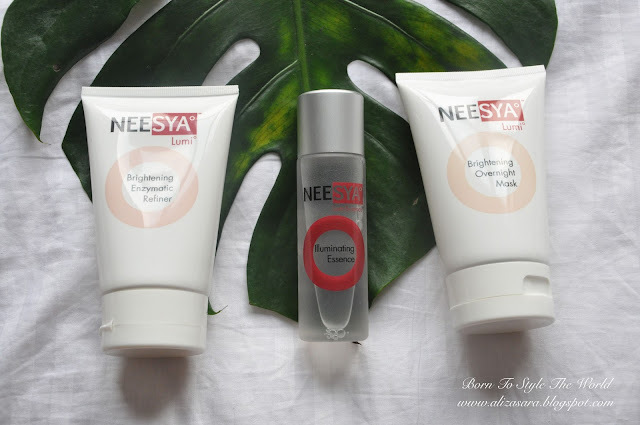 And first up would be the NEESYA's Brightening Enzymatic Refiner, followed by the Illuminating Essence and the Brightening overnight mask. 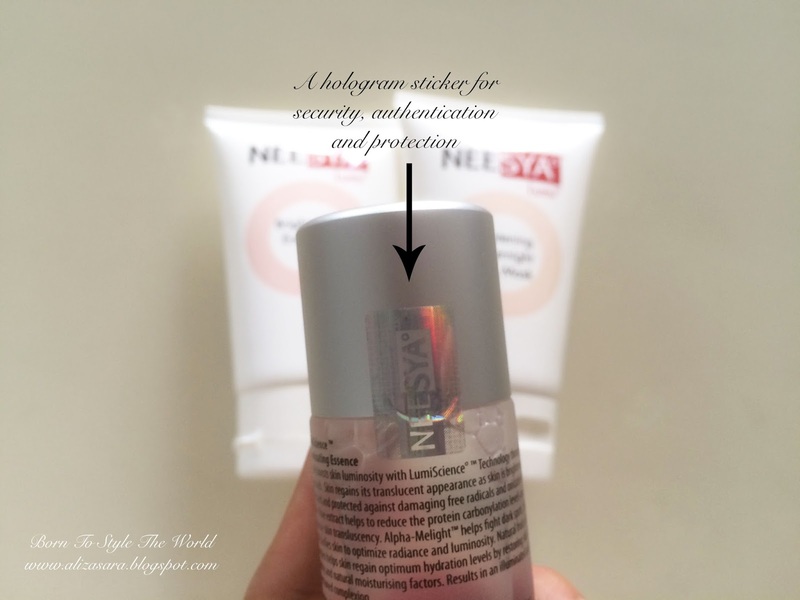 By the way, all of NEESYA's products comes with a hologram sticker which is an effort to protect authentication. Now lets start! For Day and Night use. The texture of NEESYA's Brightening Enzymatic Refiner. First up, would be to use the Brightening Enzymatic Refiner. Its works as a 3 minute leave-on exfoliator, and at the same time also cleans your deep pores to instantly get brightening results. Its formulated with papain, and efficiently lifts away lifeless skin cells to reveal a brighter, smoother complexion. 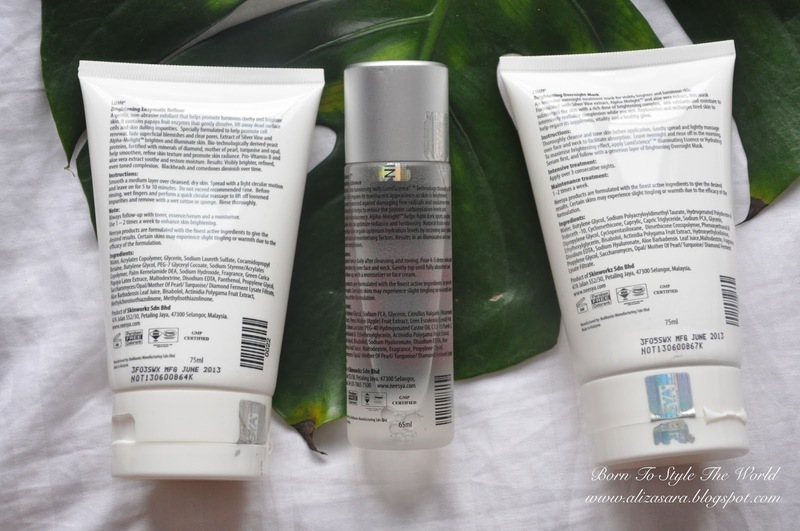 It also has an Extract of Silver Vine Extract and AlphaMelight which complements the exfoliation process with skin brightening effects, while Pro-Vitamin B and aloe extract restore hydration to help skin regain its glowing vitality. Very gentle and doesn't produce much foam. As said in the instructions, apply a smooth layer over dry skin, covering over the face and neck area. Apply a thicker layer over stubborn dark spots. Massage lightly in a circular motion for about 30 seconds and leave on for another 3 minutes. Use this 1 - 2 times a week for optimum brightening effects. The Illuminating Essence, transparent with a diluted mucus texture. Next would be applying the Illuminating Essence. What it does basically would be that it visibly boost skin luminosity with LumiScience Technology through a 360 approach, which would result to a more illuminated and even your tone complexion. Or in other words, it smoothens, brightens and evens skin tone. Silver vine extract helps reduce the protein carbonisation levels and enhances skin translucency. Alpha-Melight helps fight dark spots, soothes and clarifies skin to optimise radiance and luminosity. Using a cotton pad to apply it to my face. I love that the texture isn't like your usual emulation lotion, but it is slightly more dense compared to liquid. 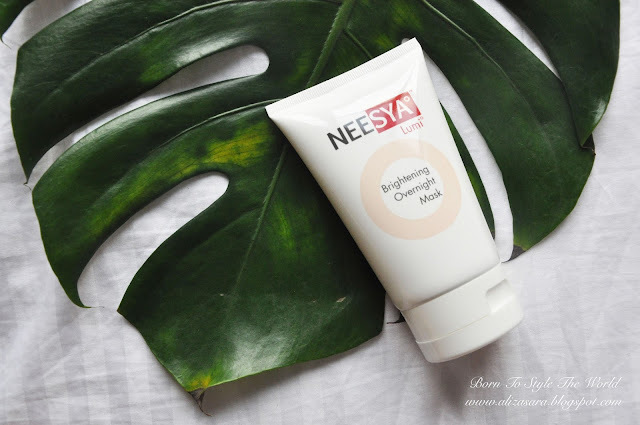 This is to be applied twice daily and you will instantly see glowing radiance on your skin which i definily knew the minute my friends were telling me that my skin has been glowing after only 2 weeks of using NEESYA. Thanks NEESYA! 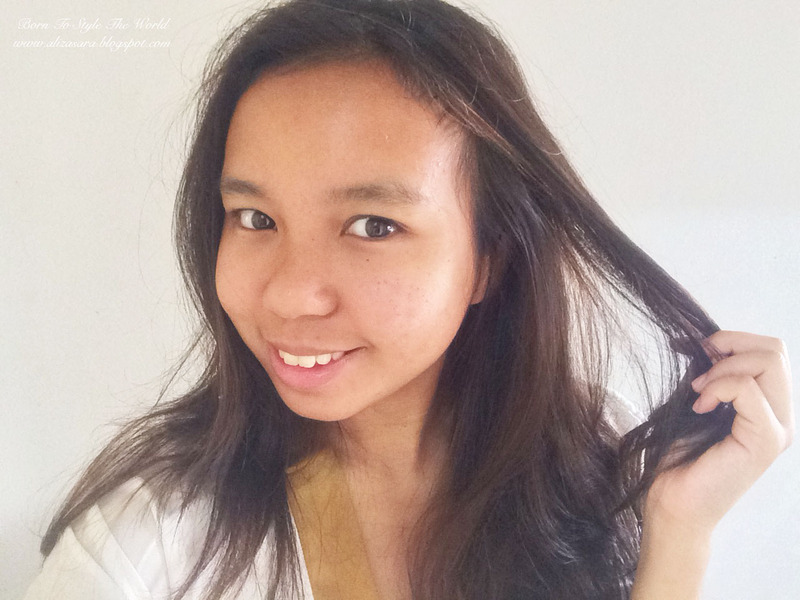 Its perfect for my combination-oily skin which i apply 4 days a week. Very well absorbent and results are almost instant, but because of its unusual texture, it might feel a little sticky once you apply it on your face. At night, you repeat the usage of the Brightening Enzymatic Refiner, followed by the Illuminating Essence and just before going to sleep, this is the Brightening Overnight Mask which does wonders while you sleep. What it does is it instantly brightens skin with intensive hydration and also has anti-oxidant protection. Its an intensive overnight treatment mask formulated with Silver Vine Extract and AlphaMelight. This particular mask contains concentrated dose of brightening complex to help diminish skin discolouration, revitalise complexion and restore skin hydration while you sleep. How it looks like once its spread around face. Like any other mask, you only need to use it once a week. The texture is rather smooth yet sticky but i absolutely love how my skin feels the minute i wake up and wash the mask off. One of the BEST sleeping mask i've ever applied on my face. For people who has a busy schedule like i do, this would be your solution to a more radiant glowing skin! Very convenient and out of the 3 products i mentioned today, this is a MUST HAVE! 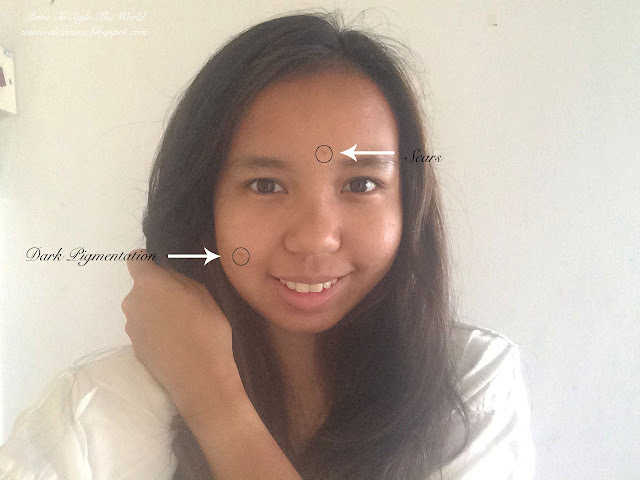 Before using NEESYA, i had pigmentation and scars. And here would be a before and after shot which you can visibly see how bright my face is after using NEESYA for only 2 weeks! Definitely worth every penny spent for instant results. There is no flaws to this amazing product and if you haven't given yourself a go with NEESYA, its about time you should. The results were beyond my expectations and I'm impressed with this local brand which we as Malaysians should be supporting. Every product comes with a brief introduction of the product and also instructions on how to apply including maintenance treatment. 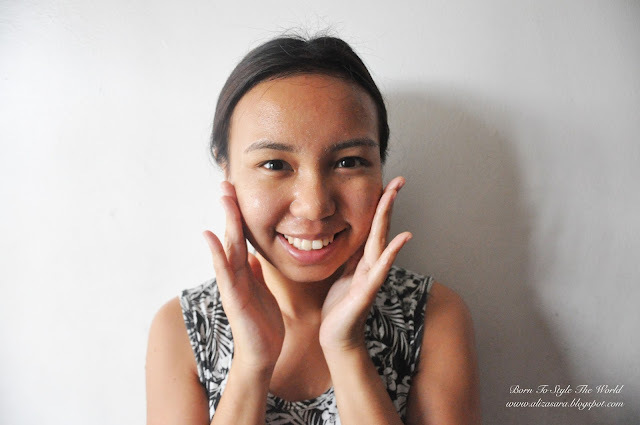 love how you showcase your face for all the facial product reviews :D.. and you have a sweet face! Great product. I have try this product before. Awesome brand! 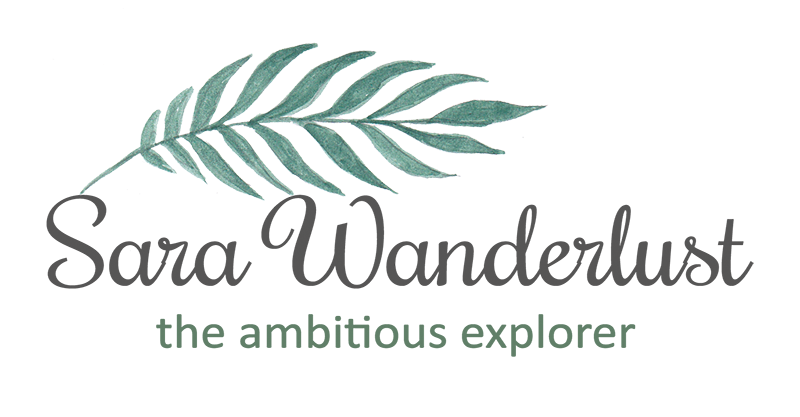 My friend just bought some products from this brand NEESYA last month and love it. Sound it works on you! 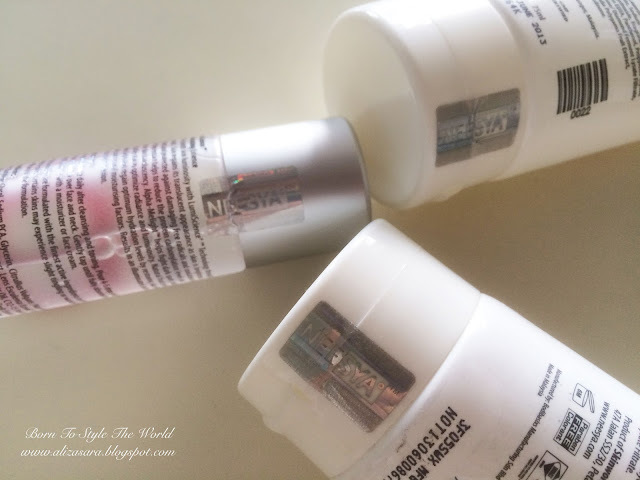 I had a Neesya product for review too. Still haven't start it.. Your skin looks awesome after applying! It really looked more radiant and clear in the after photo.